Going on a career break can be a stressful time at first, and helping your children adapt and make new friends should be top on your list of priorities. Leaving behind old friends and having to make new ones can be frustrating and difficult, especially for children. Young kids may forge new relationships quickly, but older children, especially teenagers, may take more time and rely on you for support. Moving to a new country or city and living in a new neighbourhood can be a frightening experience for many children. Some will thrive on the excitement, others will shy away from the chaos. Networking with others who have gone on career breaks in the past, or even emigrated to a different country for good, can be an insightful way to help you kids make the most of a new adventure. Listening to your child's individual needs and wants is key. Don't be a pushy parent. Encouraging new friendships is one thing, being overly pushy is another. Let your children do things in their own time. Some children are naturally more gregarious and outgoing, others may take ages before they finally agree to invite a classmate home after school. Listen to your children's needs. If your child is happy with one new friend, let him be. If he has loads of new friends but still seems miserable, listen to the reason why. Every person is an individual, and don't forget that even small children are simply little people with their own likes and dislikes. Invite other children over for a playdate. Often children find it easier to make friends one-on-one than in a group. You can facilitate this by suggesting your child invite a classmate over for an afternoon of colouring, playing or simply watching TV. Alternatively, invite a classmate or two to the local park on a Saturday afternoon just to kick a ball around or have a shared picnic. Encourage extra-curricular activities. Shared interests are a great way to bring people together. 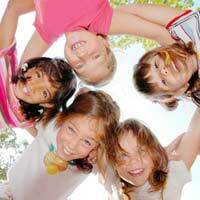 Joining clubs or interest groups after school is especially important for older children. Look on-line to see what's available in the community if the school doesn't meet your child's interests. Be a chauffeur. Offer to drive your children - and their classmates - to football practice, drama club or swimming lessons. Carpooling will give your children the opportunity to make relationships with children they may have normally overlooked. Schedule a talk with their teacher. If your child fails to make one single friend after a few weeks or a month, talk to their class teacher to discover what potential problems exist. Knowing the root cause will make it easier to find solutions and give them the support they need. Signs that not everything is hunky-dory include poor grades, tummy upsets, reluctance to attend school, difficulty concentrating, bed-wetting and over-reliance on adults for company. The ability to make new friends is important. Psychologists say that even early on, this ability is vital for the future success of everyone - even more important than IQ tests or school marks. A huge amount of learning comes from our interaction with others, so even academic success can hinge on the friendships we forge, and how we connect with others. Helping your children to make new friends while on a career break is vital. Our peers help us to pass on knowledge, have a good time and enjoy everyday activities, they also provide us with emotional support throughout our lives. Helping your children to make long-lasting friendships will help contribute to their happiness while you're away, and in future.